I am a huge advocate of nutritious, yet easy dinner meals. You don’t need an extravagant nine course meal in order for dinner to be healthy. It can be easy. Eating healthy is not rocket science; however, it does require planning and organization. Meal planning is an important tool I like to teach my clients. This post will focus on easy meal ideas. Here is my basic method and rule number one for planning meals. Try to include all 5 food groups. That is all. You need a source of protein, a grain, a vegetable (preferably two vegetables), a fruit and a dairy food. Voila! 1. Breakfast! My favorite meal of the day… for dinner. Have eggs, waffles or breakfast sandwiches. Serve with fresh fruit. Vegetables can easily be incorporated into this meal! Make a big salad; add any fresh vegetables you have on hand. Serve with bread, a roll, or crackers. Choose toppings: tuna fish, grilled chicken, taco seasoned ground beef or turkey, olives, canned beans, roasted peppers, artichokes, cottage cheese, sliced or shredded cheese, hard-boiled eggs, cold cuts, dried fruit, nuts or seeds, mandarin oranges, pomegranate arils, apple or pear slices. Chose a protein source: chicken or other meat, fish, tofu, or shrimp. (This is a great way to use the leftovers). For quesadillas: put meat, vegetables and cheese on a tortilla and toast it in the oven; serve with sour cream and salsa. Add some fruit on the side… or make a fruit salsa! Cook pasta, frozen tortellini or ravioli. Add tomato sauce, fresh or frozen vegetables, leftover chicken, lean hamburger or beans. Instead of tomato sauce, add olive oil, garlic and parmesan cheese. To complete your meal: add a side salad or cooked vegetables and some fruit. Boil a whole chicken in water with fresh vegetables and add some pasta or rice. If you don’t have a whole chicken; you can add meat, vegetables, cheese, noodles, or any other ingredients to boxes of broth or canned soup you have on hand. Simple and easy! Add tuna, sliced tomatoes or roasted red peppers. Serve with soup, fruit and vegetables. 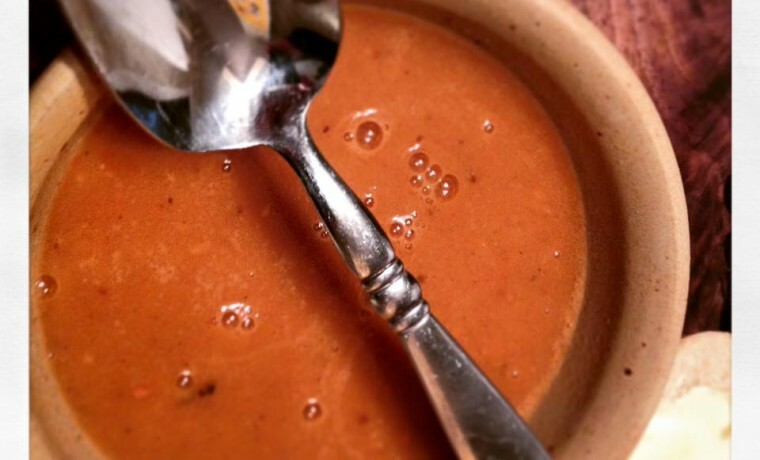 The tomato soup recipe below was developed by a colleague (and friend), Cat Macera, Owner/ Manager of the Herkimer Farmers’ Market. When it comes to cooking, Cat is my inspiration. She cooks from scratch and always uses fresh and unprocessed ingredients. This recipe goes to show you that a healthy dinner does not have to be complicated. Other than the ease, I love this recipe because it includes beans (one of my favorite foods). What a great (and cheap) way to add fiber and protein to a meal! 2. Reduce heat and simmer for about an hour. 3. Using a blender, food processor or immersion blender, puree soup (in batches if necessary) until the soup is smooth and thicker. Hints: Freeze this for later consumption! Or portion into small containers for a quick and easy lunch meal!